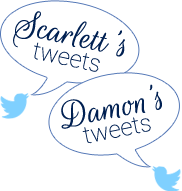 Damon and I have done some strange things to celebrate our anniversary. Some highlights have been the year that we attended the Angola Prison Rodeo, the trip to Houston to see Wicked when we brought his parents along, and our first adventure race together in the spillway two years ago during which it rained all day and we almost got into a fist fight over a "navigational error." (Thanks, Kirk, for breaking us up. We'll try not to have a repeat this year.) You get the point, we are weird and we enjoy celebrating by doing weird things. Well, this year, we decided to celebrate our 8th wedding anniversary by giving one another the gift that keeps on giving: a medical procedure. I think you know that you have a rock-solid marriage when one spouse says to the other, "For our anniversary, we are getting tubes put in the baby's ears," and the other replies, "Thanks!" and the whole exchange is completely sincere and does not include a single hint of sarcasm. On a side note, another tidbit of Damon and Scarlett trivia is that if you count from when we started dating, we have now been together almost 11 years (and by almost 11, I mean 10 and a half, which is only 11 in elementary education major math.) Considering our ages, we have been together over 1/3 of our lives! Wow! What a lucky guy Damon is. It truly boggles the mind. Anyway, April 14th, 2009, we woke up bright and early at my in-law's house (5 a.m. early) and bundled Stella into her carseat without waking her up. (Go me!) 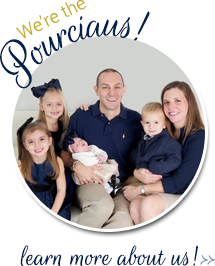 We drove into Baton Rouge to the Brass Surgery Center, and a short while later surrendered our most prized possession into the hands of doctors and nurses who promised to help her hear better and have fewer ear infections. About 30 minutes later we were invited into the recovery room to the ear-splitting, frantic screams of our offspring. As Stella freaked out while coming down off the anesthesia, Damon and I gazed lovingly into each other's eyes and thought, "How romantic! From the sound of these screams, I am so glad that we chose tubes! Stella is acting like it was a truly enjoyable experience." After about 15 minutes of this wailing and gnashing of teeth, we decided to brave the car ride home, but were only willing to go as far as Damon's parents house. Once in the car, Stella fell fast asleep. She woke up bright eyed and bushy tailed at her Grandmere and Grandpa's house. We all played for a couple of hours and then Stella and I had a glorious, 3 hour nap/cuddle. Poor Damon spent that part of the celebration holed up in his parents' office working. That night we returned home. So that was it for our big anniversary. We can only imagine what excitement awaits us next year! Now that you have suffered through my sappy, romantic anniversary tale, (just to clarify, that part was meant to be sarcastic)I will reward you with some pictures. In our home, cleanliness is next to Godliness. Stella LOVES to brush her teeth. 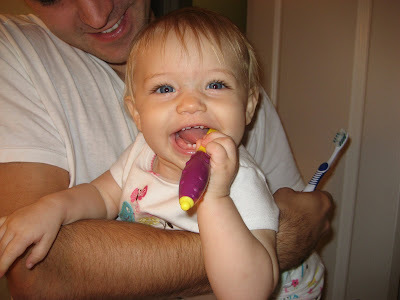 Here is our little dental hygiene nut in action. 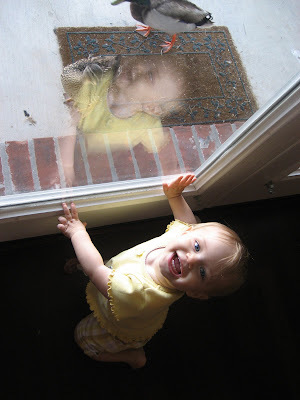 It is no longer enough for us to go outside and feed the ducks daily....they now peck on the patio doors to get to Stella. 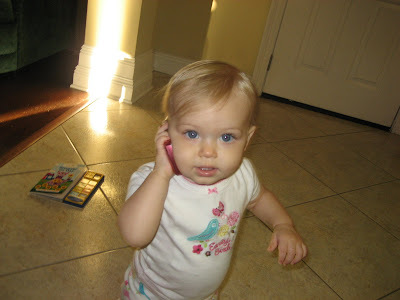 Chatting on mommy's phone. Stella really prefers a blackberry, but as Grandma Crane would say, "Beggars can't be choosers." 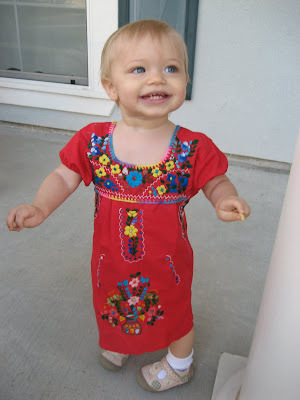 My little senorita in her dress from Mexico. Don't worry. We washed the swine flu germs off of it. These next pictures make me happy and sad. 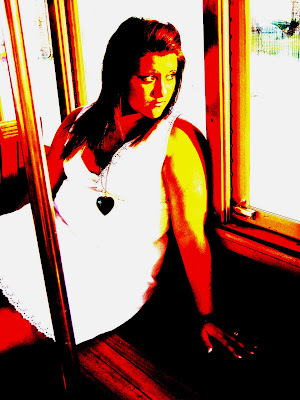 Tabitha and Angie visited us last weekend so that Tab could take her senior pictures in City Park. It was so great to spend the weekend with my other mother and sister! We had a marvelous time taking pictures (Thanks, Dara and Matt for being so patient! You made it such an awesome day!) I was filled with joy to see Tab and Angie, and I'm also super proud of Tab and all that she has accomplished to make it to her graduation, but at the same time, I am sad to see my first baby all grown up! 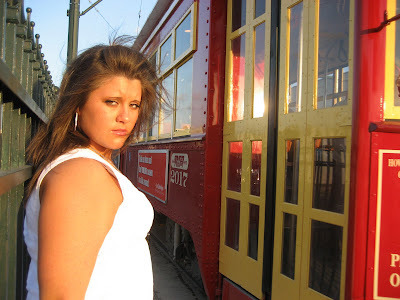 I remember sitting in my living room wearing a neon bandana around my neck and kissing Tab's soft little baby head and now she is a grown woman....too grown, from the looks of some of these pictures...but enough boohooing. Tab and I kept Dara and Matt an extra hour with all our outfit changes, so we ran out of time to take any streetcar pics. Tab and I decided to stop at the end of Canal and hop on a car for some quick pics with my lowly camera. Angie and I love this first shot, but Tab hates it. I think she looks like a model. Don't you love the wind blowing her hair? Damon made this one artsy fartsy because the original accidentally got saved over. Oops! It's still cool... Looking way too grown up for my taste... Same artsy shot, just farther back and with no effects. 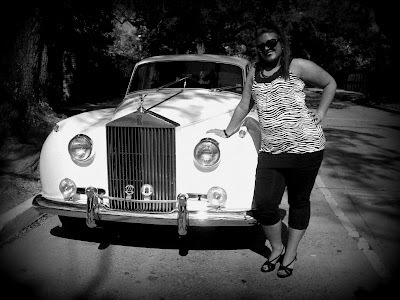 I allowed Tab to pose for some pictures with my Rolls Royce. Haha! Hope you enjoyed the story and the pictures. I have not posted nearly enough in April. I will try to give you more Stella in May. Unwrapping some gifts. She finally got the hang of it! Gift opening help from the Welch's and Guillory's. Reading a card with MawMaw Shirley. Since the unwrapping was going too slow, Sadie had to step in and use her expertise... This shot was LITERALLY taken 2 seconds later...that kid is like lightning! Spending some time with Uncle Benny and Aunt Eloise. Stella did not want Aunt Eloise to put her down. Grace and Madison helping with more gifts. Emma is always so sweet to Stella. She is such an awesome big sister to Sadie and Talia!